The first financial reports to review first are the Balance Sheet, Profit & Loss, Accounts Receivable Aging and Accounts Payable Aging. These need to be reviewed using the Accrual method, not using Cash Basis. So many business are frustrated with their financial reporting, because when they present them to a banker for a loan, the banker can tell something is not right just by looking at the Balance Sheet. As a business owner, analyzing your financial reports on a monthly basis is critical to your financial success, and you must also put in place processes to provide accurate reporting. Don’t assume that your internal accountant understands it all, and don’t assume that your outside CPA is checking this for you, or that either of them understands federal contracting rules. 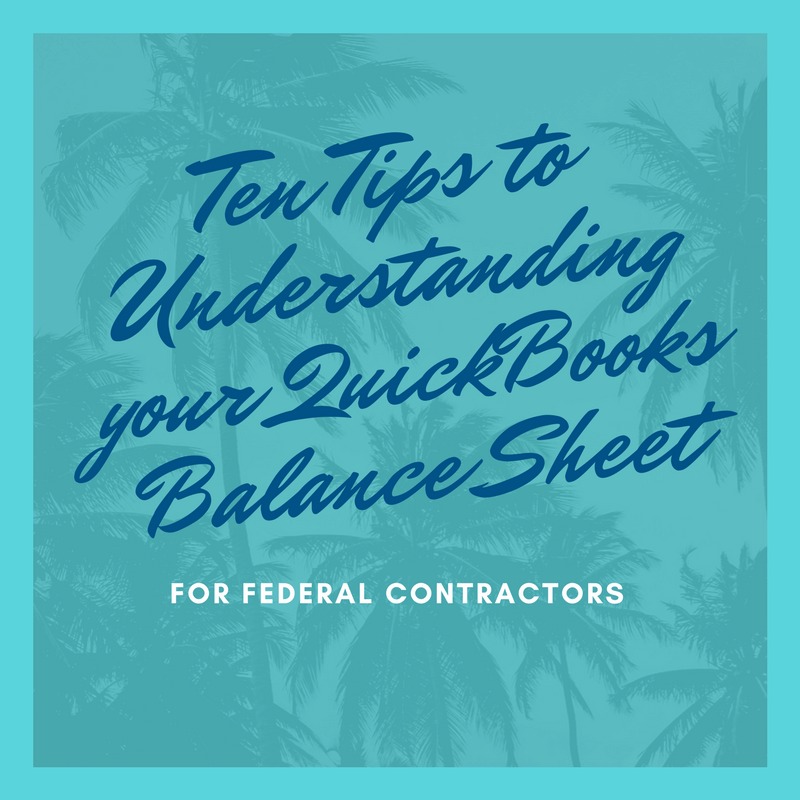 As a federal contractor, until the basic financial data is under control, while you think you have set up a DCAA compliant system with direct and indirect costs, isolation of unallowable costs, ability to compute indirect rates for fringe, overhead and G&A, and providing accurate Profit and Loss by Job reports – you really don’t have anything if your Balance Sheet is not accurate. And it’s not time to spend on an accounting software for federal contractors yet either – get the basics in place and make sure you and your internal accounting team can do the reporting needed using your current system. If you are a small business owner and you are trying to run your own QuickBooks accounting system, here are the keys to making sure your financial data is correct: Focus on the BALANCE SHEET first. Cash is your bank account balances minus any outstanding checks. On the Balance Sheet, you should see all of your bank accounts listed. Look at the amounts shown for each bank account – these are the ending balances. Each account listed should agree to your bank statement. When it doesn’t, first go to the DATE at the top of the Balance Sheet and change the end date back to an accounting period that has been completed (or to use the accounting term “has been CLOSED.”) Next, reconcile your bank statement. If you’ve never done the bank reconciliation in QuickBooks, follow the tutorial to learn the steps. If you can’t get it to balance, there is an “ADJUSTMENT” you can choose and that will force the creation of an adjusting Journal Entry. Then run the Bank Reconciliation process through the current period until you are caught up. Accounts Receivable are invoices that you have sent to your clients that they have not yet paid. First, check the accounting period end date as we did above and make sure you are looking at the most current “who owes me money” situation. Write down the total. Go to Reports, Financial Reports, Accounts Receivable Detail and run the report, using the same accounting period ending date as was selected above. Make sure this total matches the total of “who owes me money.” The report normally sorts by date and split it into an “Aging” which is Current, 30, 60, 90 and more days. Chase down anyone who owes you over 60 days first. After you have some payments in your hand, run to the bank and deposit them. When you get back to your office, use Receive Payments to record the payment. Re-run the AR Aging and repeat. Accounts Payable are the invoices that vendors and others have sent you. Again, go to the top of the report and change the accounting period end date to your last closed month. Write down the total and pat yourself on the back because you say “hey that’s not too bad.” Next, think about what you REALLY owe for Accounts Payable but haven’t had time to put “in the system.” These include the supplies you picked up at Office Depot, the VISA bill with its list of: business lunches; monthly charges for your cell phone; the airline tickets for your trip next month; the car rental receipt and hotel bill for your last 2 trips to DC that you haven’t had time to do an expense report for. Oh, and you have to enter per diem and also find the UBER that you put on your personal card and get reimbursed for that too. Odds are, you look at that balance and realize you have a stack of items that came in the mail or someone e-mailed you or that you haven’t had a chance to review and you suddenly realize that those aren’t even included in the total. It’s just been simpler to put those costs “in the system” when you write checks to pay for it – which is okay except you haven’t been in the office to write checks or get that caught up. By the way, Credit Card Payable may be on another line, but it’s just another variation of Accounts Payable. Skip the networking meeting that would have actually been useful and sit down and type all this info into Quick Books. It will probably take most of the day because it’s tedious and you’ll have to stop and find receipts, possibly go online and check your credit card statement and see if you can remember what you bought with pay pal for $52.12 in May. Or, put it on your list for something else to get done on Sunday after you work on the proposal that’s due on Tuesday. Fixed Assets should be easy, if you are a small business because you can write most of this off immediately. So, for items over a fixed capital threshold, you will see an entry for the $2400 for three laptops, and immediately below that $2400 for accumulated depreciation. That balance is accurate for your tax return. However, if you are a federal contractor, you still have to comply with recording depreciation, in order to match the benefit of those computers to the usage of those computers. You’d expect that the laptop will be good for at least three years before having to buy a new one, or that when you buy the next one for someone who needs a more powerful laptop plus its advanced software for your cyber team, that the old laptop still works and you can start using that one yourself and promise that the kids won’t be allowed to contaminate it with the viruses that got on your old one. Depreciation is part of MATCHING costs to the accounting periods that they benefit. In your head, you do this all the time when justifying the purchase of a car. You sign a $35,000 car purchase and you’re paying it over over 60 months, because that’s how long you expect to drive the car. You’re not considering the $35K to be part of your current month’s household budget – otherwise how would you rationalize it! Shareholder Loan, Loan to Shareholder – where either you as the shareholder had to loan money to the company or the company made you a loan, If the amount is in the Asset Section (top part) of the Balance Sheet, then the company loaned you money and one day you may pay it back or you could offset it with distributions and draws and settle it up. Usually, your CPA will give you advice on this since there are tax implications as well as methods to give you the cash flow the way that works best for you. Draws and Distributions are all variations of the same type. The company was making money and you took some money out that applies against previous earnings (usually called Retained Earnings). Again, this is something your CPA would advise you on. This is over and above your paycheck, which is compensation for you as an employee of the company earning a salary for hours of work. Equity is what you used when you started the company. It’s listed as Common Stock for the $1000 you kicked in when you put money in the corporate bank account at day 1. Quick Books frequently lists it as beginning balance equity – and that number should never change, so if you are making a QuickBooks entry and it goes back to a prior year, and you get the error message about “this will change the beginning balance in Equity” – stop and ask for help. Net Income is coming from your Income Statement, which QuickBooks calls Profit and Loss. Check the end date on your Balance Sheet, and then go run the Profit and loss for the current year through the same date (Reports, Financial Reports, Profit and Loss Standard). Make sure the amounts agree – if they don’t then check the range dates first. Retained Earnings is the sum of the net income from previous years. If in the first business year, you made $20K, and the second year you doubled your net income to $40K, then the Retained Earnings on the Balance Sheet after year 2 would be $20K plus $40K = $60K. If your Balance Sheet is accurate, then you can compare it to last year and see if you’ve improved. The Balance Sheet shows the financial strength of the company. As a Small Business, you don’t just measure whether there is money in your Operating account – but how you are employing the cash flow you have to grow the business. If your Balance Sheet is NOT accurate, you have some work to do – because there are some transactions recorded incorrectly, and fixing them will take time, and likely reduce your net income. This is just one of many topics covered in Solvability’s DCAA Compliant QuickBooks Boot Camp. If you are a small business in federal contracting that wants to price more competitively, win more contracts and improve profits, let’s set up a free system assessment call now to see if and how I can help you.